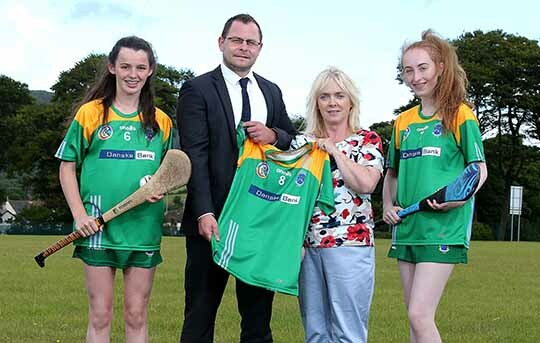 St. Louis Grammar School’s camogie team has received a £1,000 bursary from Danske Bank to buy a new kit. St. Louis was one of four schools in Northern Ireland to win a new team kit as part of a Danske Bank promotion for its Danske Discovery current account holders. The bursary celebrates Danske Bank’s ongoing sponsorships of Ulster Schools’ Cup Rugby, Ulster Schools’ GAA and U18 Schools’ Football. Pictured (L-R) are St. Louis Grammar School are team captain Lily McAllister; Danske Bank Kilkeel Branch Manager, Andrew Laverty; Head of PE, Rosemary Colgan and Vice-captain, Tori Herron.